Windstar, a cruise company known for its small luxury cruises, is adding new ports and significantly extended cruise itineraries to its offerings for 2019 and 2020. During an interview with TravelPulse, the company’s director of revenue and itinerary planning, Jess Peterson, revealed the details surrounding the company’s many exciting new offerings, including sharing information about itineraries that have yet to be publicized. The company, which maintains a fleet of six yachts that carry just 148 to 310 guests, has developed four new grand voyages for the coming two years, featuring itineraries that range from 51 days to more than 60 days in some cases. Among the newest of these itineraries is the recently published Grand Mediterranean Cruise aboard the Wind Surf, the world’s largest sailing ship. The 51-night voyage (Windstar’s first itinerary offering over 50 days) takes passengers from Lisbon to Barcelona and includes a long list of stops in between such as Gibralter, Malaga, Athens, Venice, Monte Carlo, Cannes and Dubrovnik. In addition to being noteworthy for its lengthy itinerary, the cruise also includes a handful of new ports and a focus on being port intensive without contually revisiting destinations. “For a 51-night cruise, we only repeat a few ports on the entire thing and they are Santorini and Dubrovnik, places everybody would want to go twice,” Peterson told TravelPulse. As for the new ports slated to be part of the Grand Mediterranean Cruise, one of the most intriguing is Komiza, in Croatia, a place Peterson described as very small and picturesque. The itinerary also includes 10 nights exploring the Greek isles and an overnight on Mykonos to give travelers more time to shop, explore or relax on the beach. The second new grand voyage itinerary from Windstar is its Three Americas Cruise, a 39-day experience that can be extended to 65 days by adding segments in Alaska and the Caribbean. Offered on the Star Legend, this trip will take passengers from Vancouver, British Columbia to San Juan, Puerto Rico. Like the Grand Mediterranean Cruise, there are several new ports on this trip as well. The remaining two new grand voyages from Windstar have yet to be publicized. But Peterson shared a few details about each one. 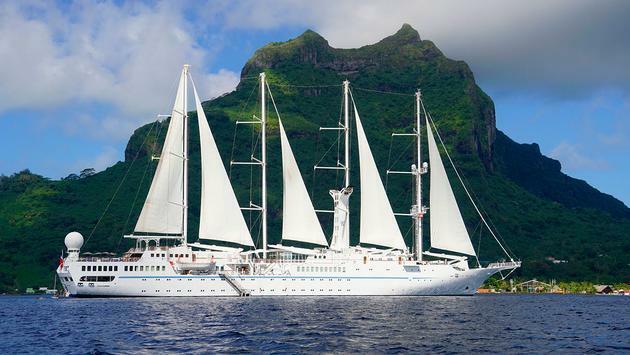 In the winter of 2020, the Wind Surf will offer a 56-day Grand Caribbean Cruise visiting such ports as Philipsburg, St. Maartin; the British Virgin Islands, Barbados, Aruba and even a partial transit of the Panama Canal, which is entirely new for the Wind Star, a ship too big to make the entire passage. All of the ports in Mexico are new for Windstar, as are Jamaica and a few other Caribbean stops. 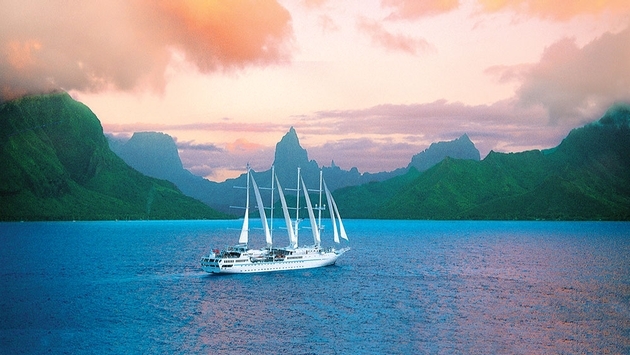 Windstar Cruises’ Wind Spirit in Tahiti. The fourth and final new grand voyage that Peterson offered a sneak peak of will feature a journey on the Wind Spirit from Tahiti (where the Wind Spirit is permanently stationed) to Singapore, where the ship will be placed on dry dock for about one month. The total cruise length is to be about 60 days, but the final details are still being ironed out. The departure date is likely to be February 2020. While all of Windstar’s grand voyages are exciting in their own right, Peterson also sought to emphasize that they are all designed to be fully customizable. Travelers do not have to book the entire itinerary but instead can choose to experience smaller segments, as short as one or two weeks. For instance, on the Grand Caribbean cruise, travelers can choose to just book the nine-night partial Panama Canal transit. Individual grand voyage segments, whether one week, or two, or more, are designed to stand alone, Peterson explained. “Each segment is a good cruise on its own. That’s something we are especially proud of,” he said.